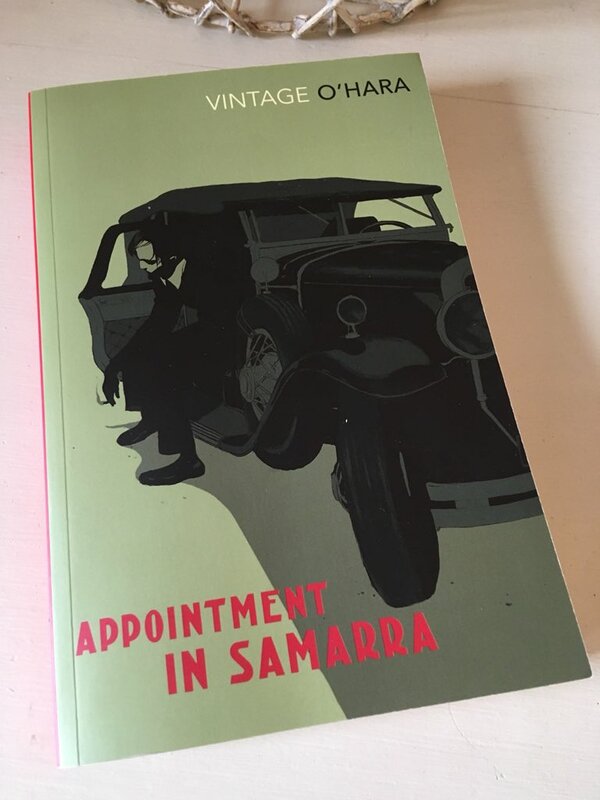 First published in 1934, Appointment in Samarra was the debut novel of the American writer, John O’Hara. In short, it charts the rapid downfall and self-destruction of thirty-year-old Julian English, a successful businessman who lives in the fictionalised town of Gibbsville, Pennsylvania. As a commentary on the shallowness of a particular stratum of American society, it is very strong, particularly in its depiction of the rather skewed values that drive the main protagonist’s actions and behaviours. On the surface of things, Julian English appears to have everything going for him. He runs a well-established Cadillac dealership in Gibbsville, has plenty of contacts with the town’s movers and shakers, and is married to a beautiful wife who remains faithful to him. Julian and Caroline English are part of the prestigious Lantenengo Street set who hang out at the local Country Club, a place where the preeminent social milieu is clearly evident. However, underneath that outwardly respectable exterior, Julian harbours a self-destructive streak, something that possibly stems from the nature of his family background – particularly the expectations placed on him by his father during the preceding years. Personality-wise, Julian is impetuous, disillusioned and abrupt. Over the course of three days at Christmas, the novel follows Julian as he drinks too much, picks arguments with the wrong people and generally makes a complete fool of himself. It all starts when Julian throws a drink in the face of Harry Reilly, a man he has never really liked in spite of his standing in Gibbsville. By Christmas morning, news of the incident is all around the town – a situation made all the more notorious by the fact that Harry appears to have sustained a black eye, presumably from the ice cubes that were present in the drink when it was thrown. As far as Julian sees it, the whole thing is a storm in a teacup. Surely there have been other, more outrageous ‘crimes’ in the past, episodes with more serious consequences than something like this? And anyway, Harry Reilly had it coming to him. The trouble is, with Harry Reilly’s influence spreading far and wide, it doesn’t do well to have him as an enemy. Several of Julian’s friends and business associates already owe Harry money, a fact that seems likely to influence their reactions towards Julian in the days that follow. Moreover, the fact that Harry is Catholic puts him in a strong position to call upon the support of the church and other prominent worshippers in the area. As Julian soon discovers, a lucrative business deal with the local undertaker – currently in the market for a prestige hearse – is already at risk of being scuppered, almost certainly as a consequence of his rash actions. This seemingly small incident represents the beginning of a chain of events which constitute Julian’s fall from grace. Somewhat ironically, the damage caused by each individual misstep could be contained on its own – in other words, if it were a single violation as opposed to one element of a broader pattern of behaviour. Instead, it is the cumulative effect of the fallout that causes the real damage here. O’Hara does something very interesting in the way he presents the Harry Reilly incident to the reader. Rather than describing what actually happens when Julian throws the drink at Harry, O’Hara shows Julian thinking about throwing it – not with any serious intentions of doing so, just daydreaming about it at this point. In fact, it is only through the responses of other people after the event that we get to hear about the incident itself. As a consequence, the very act of Julian throwing the drink seems to be magnified, which only adds to its impact and notoriety. Something similar happens with the second of Julian’s missteps when, once again, the fine details of the episode occur off-camera, a technique that lends a degree of ambiguity to Julian’s actions. Perhaps unsurprisingly, interested observers assume the worst, a situation which leaves Julian feeling the heat from multiple angles – mainly from his wife, Caroline, and the powerful mobster, Ed Charney, whose louche mistress was the target of Julian’s attention that night. As everything starts to unravel for Julian, we learn more about the early years in his life, particularly the relationship with his father, William Dilworth, a doctor and upstanding member of the Gibbsville community. As he came to young Julian’s rescue after the latter had been caught shoplifting, William English wondered whether the sins of his own father had come home to roost with the old man’s grandson. While Julian never stole anything again, he was left feeling a constant disappointment to his father especially as far as his career and the management of money were concerned. There was a time when Dr English wanted his son to join (and ultimately take over) his own prestigious medical practice – but Julian had other ideas back then, preferring instead to take advantage of the boom years of the 1920s. Appointment in Samarra is an interesting look at the social elite of Pennsylvania in the early 1930s, the sort of people who had become accustomed to a certain standard of living, viewing it as a kind of entitlement as opposed to something that needed to be earned. The novel is full of little observations on the social codes of the Lantenengo Street milieu. While the town’s manual workers are still feeling the pinch from the decline in demand for coal (the local anthracite mining industry has struggled to recover from two lengthy strikes in the ‘20s), there is still plenty of money in evidence amongst the Gibbsville Country Club set. The book is full of observations like this, fine details which add a sense of authenticity to the world O’Hara is portraying here. The novel’s title comes from a brief parable by W. Somerset Maugham, a sort of retelling of an ancient cautionary tale. Maugham’s piece forms the novel’s epigraph – and with the benefit of hindsight, it seems a very fitting scene-setter for the book. Appointment in Samarra is published by Vintage Books; personal copy. This entry was posted in Book Reviews, O'Hara John and tagged Book Review, Classics Club, Fiction, John O'Hara, US, Vintage Books on September 4, 2018 by JacquiWine.